May 9, 2013, 1:24 p.m.
By Caroline O’Donovan @ceodonovan May 9, 2013, 1:24 p.m. But that wasn’t always the case when it came to personal journals. At least, not according to Lee Humphreys, a communications and media researcher at Cornell. Humphreys led a conversation this week with Microsoft Research’s Social Media Collective on historicizing social media practices. Humphreys argues that, through journals and diaries, people have been recounting their daily activities and reflecting on them for much longer than Twitter and other social media platforms have been around. But through her research, Humphreys found that it’s only been in the last hundred years that journalling has come to be considered a private practice. In the late 19th century, she says visiting friends and relatives would gather together and read each others diaries as a way of keeping up to date and sharing their lives. 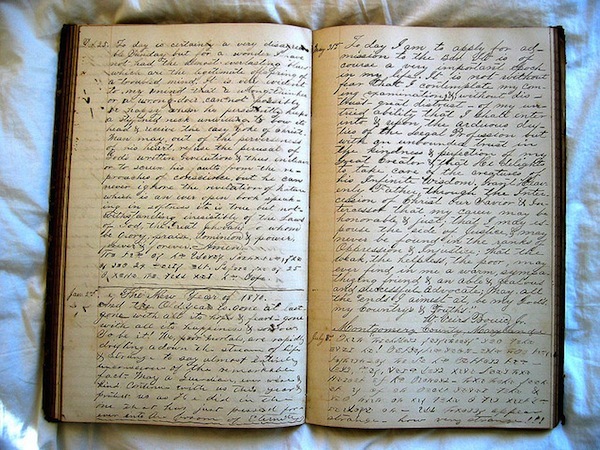 Journals were also kept in early American towns to mark and record important events: weddings, births, deaths and other events of community-wide importance. At Humphreys’ talk on Tuesday, some suggested that the advent of Freudian psychology — or perhaps the mass popularization of the novel — had contributed to this inward turn by America’s diarists. As the profession of journalism began to rise at the beginning of the 20th century, the independent writer was becoming increasingly self-reflective, creating the expectation of privacy that we were familiar with prior to the arrival of the Internet. But Humphrey is arguing that before we had a mass media, there was a system of personal writing that looked like a slower, more loosely networked version of Twitter. people want to make twitter their diary but isn’t a diary suppose to be private? The similarities between Twitter and historic trends in diary keeping don’t stop there, according to Humphreys. She points to a surge in the popularity of pocket diaries, which, like Twitter, restricted the number of words you could write due to their small size, but also made them mobile. With 60 percent of tweets now being written on mobile devices, according to Humphreys, as compared to around 14 percent when she conducted the study in 2008, trends in Twitter behavior are in fact reflecting historical trends in self-reporting. So even the practice of making notes about your daily activities as they are happening isn’t a new behavior. A second study Humphreys conducted revealed even more lessons about our drive to create personal records. Using the diary entires of a soldier in the Civil War, which he dutifully copied and turned into letters home, and the personal blog of an Iraq War soldier, Humphreys explored the reasons people feel compelled to record the events of their lives. Primarily, she says, people journal as a way of strengthening “kin and friend” relationships. The soldier in Iraq, referred to as DadManly, originally began his blog as a way of keeping in touch with all of his family members at once. Charlie Mac, the Civil War soldier, exhibits a similar desire for communication and relationship maintenance by sending home a faithfully transcribed (we assume) copy of his diary. Both men, Humphreys says, described experiencing profound frustration and anxiety when the medium through which they communicated was disrupted, whether by an Internet blackout or a rainstorm that dissolved parchment and delayed the post. The writings of Charlie Mac and DadManly shared another important similarity: Although both were writing for ostensibly private audiences, there was an implicit understanding that their words might someday reach a wider audience. When DadManly saw web traffic from strangers, he began to increasingly write about his political views on the war, providing what he believed to be a unique perspective of support at a time when very few journalists in the traditional media felt the same way. Charlie Mac also had reason to believe his diary letters were being shared with an audience larger than the one he was directly addressing. In fact, he sometimes included parenthetical addresses to specific individuals, should they happen to come across the documents. But there was also a real possibility that his war correspondence would be picked up and reprinted by newspapers. (Or, as it happened, compiled, archived, and read by researchers hundreds of years later.) After the war, he ended up becoming a journalist at The Boston Globe. What more apt analogue to the media of today than a world in which one’s personal commentary on current events is so appreciated that they can be transformed into a lifelong career? During the course of Charlie Mac’s budding career, he would have observed the budding of what we consider the traditional media hierarchy. Information would increasingly begin to flow from the top down, rather than be gathered voraciously from amateurs in the field. He would see news brands begin to shape and control narratives, and come to exist in an information system with less and less emphasis on personal interactions. Of course, what we’ve seen in the decades since the dawn of the digital age is just the opposite. Humphreys said one of the early conclusions from her research is the possibility that the mass media of the 20th century was in fact a blip, a historical aberration, and that, through platforms like Twitter, we are gradually returning to a communication network that indulges, without guilt, the individual’s desire to record his existence. Personal diarists are not only comforted by recording and sharing their experience, Humphreys says, but they are empowered by claiming their own narrative. She suspects it was for this reason that so many 19th-century women kept journals — in the hopes that they and their families would be remembered. Her point takes on contemporary significance when she points out that Twitter is more popular among African-American and Hispanic youths than among whites. The most powerful argument for Twitter as a force of erosion of the public media is not, as we hear so often lately, that it feeds the fires of rumor and speculation. The argument that Twitter is facile is much more potent — that Twitter users are self-obsessed, that a minute spent tweeting is a minute wasted, that Twitter is the digital embodiment of the general degradation of intellectual society — many of the same arguments made a decade ago about blogging. What Humphreys has found, instead, is that if we are all navel-gazers, it’s not Twitter that made us that way. And further, that we are tighter-networked, faster-responding, further-reaching navel-gazers, with a richer media experience, than ever before. Image by Barnaby Dorfman used under a Creative Commons license. POSTED May 9, 2013, 1:24 p.m.
O'Donovan, Caroline. "Diaries, the original social media: How our obsession with documenting (and sharing) our own lives is nothing new." Nieman Journalism Lab. Nieman Foundation for Journalism at Harvard, 9 May. 2013. Web. 18 Apr. 2019. O'Donovan, Caroline. "Diaries, the original social media: How our obsession with documenting (and sharing) our own lives is nothing new." Nieman Journalism Lab. Last modified May 9, 2013. Accessed April 18, 2019. https://www.niemanlab.org/2013/05/diaries-the-original-social-media-how-our-obsession-with-documenting-and-sharing-our-own-lives-is-nothing-new/.